Homemade ice cream is fresh, delicious and fun to make. What's more, you can customize your flavors or use the best-quality ingredients you can find. But it can be tricky to get ice cream to have that perfect firm, yet creamy consistency that is the trademark of good ice cream. Follow these tips to improve your own ice cream making technique. Ice cream is only as good as the ingredients used to make it. So if you can afford it, buy organic milk and cream and free-range eggs, making sure that everything is as fresh as can be. If you're adding flavorings or ingredients, such as chocolate, vanilla or fruit, spring for high-quality products. For instance, real vanilla, or even actual vanilla beans, makes far better vanilla ice cream than imitation vanilla. If you're like most people, you try to watch what you eat and buy low-fat versions of cheese, milk and other foods. But ice cream depends on a high fat content to create a creamy texture that won't get icy and gritty in the freezer. Once you get adept at making ice cream, you can experiment with using lower-fat milk products, such as half-and-half instead of heavy cream, but be aware that the texture and flavor won't be nearly as rich and delicious as a full-fat version. On a diet? Make ice cream an occasional treat, and serve yourself a smaller portion. Flavorings, especially extracts or alcohol, should be added when cooked custard has cooled. Don't add them to the custard when it's hot, or the flavors will deteriorate and won't be as pronounced. You could even wait to stir them in until right before you pour the ice cream base into the ice cream maker. 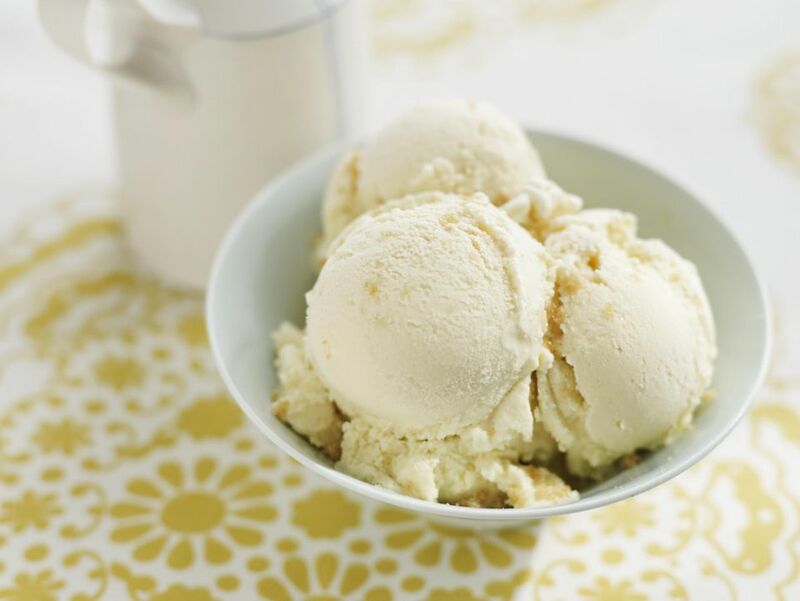 Many ice cream recipes call for making a cooked custard out of eggs, sugar and milk. After you've made the custard, it's important to chill it in the refrigerator until it's as cold as possible before putting it into your ice cream maker. Some experts even recommend "aging" the mixture overnight in the refrigerator, which will enable the mixture to be aerated as much as possible in the maker, yielding the creamiest, smoothest ice cream. Speaking of freezing, if you're using the type of ice cream maker that comes with a freezer bowl, make sure to freeze this bowl for at least 24 hours before making ice cream. If the bowl is not cold enough, chances are your ice cream will never freeze. Particularly when using an ice cream maker with a freezer bowl, it's important to turn on the motor before pouring into the ice cream base. The bowl is so cold that the mixture will freeze immediately upon contact, so you'll want it to already be in motion so that the ice cream won't freeze onto the bowl in a chunk. Adding candy pieces, nuts or dried or fresh fruit to your ice cream can add a whole new flavor and texture dimension. Mix-ins should be small, around the size of a chocolate chip, so the ice cream maker can incorporate them into the frozen ice cream. Chill them thoroughly before adding them to the ice cream, and only add them when the ice cream is already completely frozen. The ice cream maker won't need more than a minute or two to stir them in. A common complaint about homemade ice cream is that it gets hard and icy when it's stored in the freezer. There are several ways to keep your ice cream from freezing solid in the freezer. David Lebovitz, author of the book, The Perfect Scoop, recommends adding a few tablespoons of alcohol (such as a fruit liqueur to fruit-flavored ice cream, or vodka when you don't want an alcoholic flavor). Sugar, corn syrup or honey, as well as gelatin and commercial stabilizers, can all keep your ice cream at a softer consistency. Ice cream also stays softer when you store it in a shallow container, rather than a deep tub, and cover the surface of the ice cream with plastic wrap to keep ice crystals from forming. With a little practice and some good recipes (whether it's classic Vanilla or an adventurous flavor like Ovaltine ice cream), you'll be well on your way to making delicious homemade ice cream that will delight your friends and family.